The Pittsburgh Pirates head to Turner Field on Tuesday, May 23, 2017 to take on the Atlanta Braves. The expected starting pitchers are Tyler Glasnow for the Pirates and R.A. Dickey for the Braves. The odds for this matchup have Pittsburgh at +101 and Atlanta at -111. The Pirates have a 19-23-2 over/under mark and a 23-21-0 run line record. The Braves are 23-18-0 against the run line and have a 25-16-0 over/under record. The Pirates have a 20-24 overall record this season. Starting pitcher Tyler Glasnow has a 2-3 record with an earned run average of 7.34 and a WHIP of 1.95. He has 37 strikeouts over his 34.1 innings pitched and he's given up 43 hits. He allows 11.3 hits per 9 innings and he has a FIP of 5.43. The bullpen has an earned run average of 3.87 and they have given up 151 base hits on the year. Teams are hitting .258 against the bullpen and they've struck out 128 hitters and walked 55 batters. As a team, Pittsburgh allows 9.1 hits per nine innings while striking out 7.4 batters per nine innings. They are 12th in the league in team earned run average at 4.05. The Pirates pitchers collectively have given up 397 base hits and 176 earned runs. They have allowed 45 home runs this season, ranking them 26th in the league. Pittsburgh as a pitching staff has walked 129 batters and struck out 320. They have walked 3 men per 9 innings while striking out 7.4 per 9. They have a team WHIP of 1.35 and their FIP as a unit is 4.02. As a team Pittsburgh is hitting .226, good for 29th in the league. The Pirates hold a .365 team slugging percentage and an on-base percentage of .307, which is good for 25th in baseball. They rank 29th in MLB with 7.5 hits per game. Josh Bell is hitting .244 with an on-base percentage of .333. He has 33 hits this season in 135 at bats with 19 runs batted in. He has a slugging percentage of .504 and an OPS+ of 117. Josh Harrison is hitting .285 this year and he has an on-base percentage of .353. He has totaled 43 hits and he has driven in 14 men in 151 at bats. His OPS+ is 112 while his slugging percentage is at .457. The Pirates have 328 hits, including 64 doubles and 39 home runs. Pittsburgh has walked 155 times so far this season and they have struck out 314 times as a unit. They have left 296 men on base and have a team OPS of .672. They score 3.8 runs per contest and have scored a total of 167 runs this year. Atlanta has a 18-23 overall mark this year. With an earned run average of 4.13, R.A. Dickey has a 3-3 record and a 1.46 WHIP. He has 26 strikeouts over the 48 innings he's pitched. He's also given up 49 hits. He allows 9.2 hits per nine innings and his FIP stands at 6.16. The bullpen has an earned run average of 4.20 and they have given up 117 base hits on the year. Teams are hitting .233 against the Braves bullpen. Their relievers have struck out 118 batters and walked 48 opposing hitters. As a team, Atlanta allows 8.8 hits per nine innings while striking out 6.7 batters per nine innings. They are 23rd in the league in team earned run average at 4.59. The Braves pitchers as a team have surrendered 360 base knocks and 187 earned runs this season. They have given up 56 home runs this year, which ranks 11th in Major League Baseball. Atlanta as a staff has walked 137 hitters and struck out 274 batters. They give up a walk 3.4 times per 9 innings while they strike out 6.7 per 9. Their team WHIP is 1.36 while their FIP as a staff is 4.78. As a team, they are batting .261, good for 9th in the league. The Braves hold a .409 team slugging percentage and an on-base percentage of .333, which is good for 8th in baseball. They rank 9th in MLB with 9.0 hits per contest. Nick Markakis comes into this matchup batting .302 with an OBP of .374. He has 48 hits this year along with 22 RBI in 159 AB's. He maintains a slugging percentage of .390 with an OPS+ of 102. Brandon Phillips is hitting .290 this season and he has an OBP of .345. He has collected 38 hits in 131 at bats while driving in 12 runs. He has an OPS+ of 97 and a slugging percentage of .405. The Braves as a unit have 368 base hits, including 67 doubles and 44 homers. Atlanta has walked 133 times this year and they have struck out on 328 occasions. They have had 287 men left on base and have an OPS of .742. They have scored 4.59 runs per game and totaled 188 runs this season. 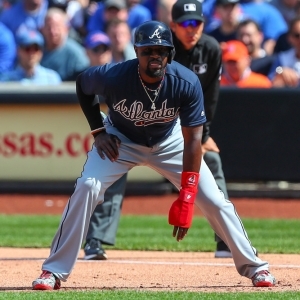 Who will win tonight's Pirates/Braves MLB game against the spread?